It’s the last of the lemonade stands and is that a slight chill in the air? Pretty soon it’s Back to School! It’s time focus on the books, a brand new school year and a new season. Shop for backpacks, new school clothes, shoes, supplies and everything your A+ students need to start the school year on a bright note. Schedule trips to the salon or barber for trims to get everyone looking great for the first day. Start the bedtime routine an hour earlier so it will be easy for everyone to rise and shine on the first day of school. Hang in there… almost ready! Don’t forget to shop online for back to school gifts for favorite teachers and coaches. 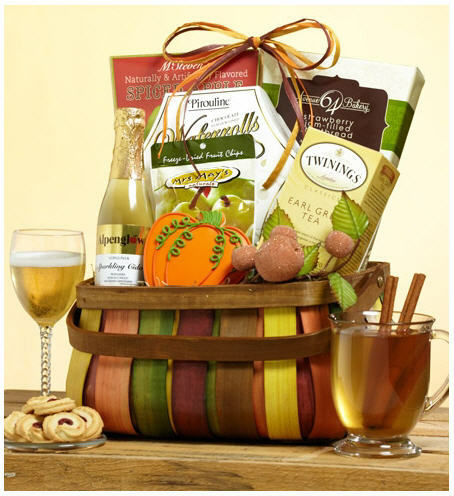 1800Baskets.com can help you with delicious gifts like Back to School Fruit & Sweets Gift Box (hurry- it’s a favorite!) and for tea connoisseurs, soothing blends like Tea Forte® Tea Chest Classic Blends Collection. Surprise your kids the first week of school with back to school treats. Unplug and put away electronic devices. A quiet afternoon does wonders to encourage a love of learning. Fruit is a wise choice, and cookies — wellll, fun! Share some juicy fruit, sweets and snacks like Premier Orchard Fruit Gift Basket, Cheryl’s You Rule Treats Pail, Cheryl’s One Smart Cookie Treats Box and The Popcorn Factory® Survival Kit Sampler Box. Pull up a chair and hear all about their school day, classes, teachers and new friends. Ask them what the best part of their day was or the funniest. Their perspective will make you lol! Your school age kids will enjoy the time after school you spend together, not to mention selecting a sweet treat. The year ahead is filled with possibilities and that’s a cause to celebrate. Shop our Back to School collection for gifts cute as a button & guaranteed to bring smiles. Walk into any dorm room and you’re bound to find a mountain of snacks for those dorm-room gatherings and late night study sessions. Rather than snacking on empty calories and foods that are filled with flavor but lack in health benefits, stock up on healthy snacks instead! Here are some delicious yet healthy options for college snacks that will not only keep you fueled, but will leave you feeling good too! It’s not surprising that fruit makes one of the best any-time snacks to keep the energy going. Filled with natural sugars, vitamins, and antioxidants, fruit make a great start to the day as well as a great midnight snack for those late-nights. While buying fresh fruit is ideal, it is also a good idea to freeze and store them for emergency purposes (like when the 2 A.M hunger hits). Did you know that nuts are filled with heart-healthy benefits AND can help lower cholesterol?! This easy-to-store snack is great to keep on hand and mix with other treats for a well-balanced snack. If you find yourself craving something with a little more crunch, then you’ll love the sea salt slim popcorn from The Popcorn Factory. At only 80 calories per single serving bag, this on-the-go ready snack is sure to satisfy. Did you know that dark chocolate is packed packed with nutrients and vitamins that are great for your heart and body?! Pair that with the natural caffeine found in dark chocolate, and you’ve got a sweet snack you can indulge in without feeling guilty about! Eat with nuts in trail mix or nibble on their own, dried fruits are one of the best snacks to keep stored in your desk as well as at the bottom of your bag; just a few small bites will give you a much-needed boost of energy. Back to school can be a bummer, so make their first day and move-in experiences sweeter with a useful and fun back to school gift! Once the gift’s content has been used up, they can then reuse the accompanying baskets for storage and organization, sending them on the fast-track to that Dean’s List! From early classes to late night study sessions, your scholar may need some help getting through the day. First, find out their caffeinated sip of choice and then choose the perfect Coffee and Tea Gift Basket to satisfy their unique tastes and needs. Between vending machines and food trucks, there is no shortage of on-the-go foods and snacks to keep them going. However, it’s because of this easy availability that your scholars may forget to grab the most important snack of the day: fruit! Keep that “apple a day” at the top of their mind by surprising them with a lavishly fresh and festive Fruit Basket filled with the season’s freshest picks. Delicious, all-natural, and all around good-for-you, the snack assortment featured in the Brain Food Market Box will keep them focused while fueling their study sessions. 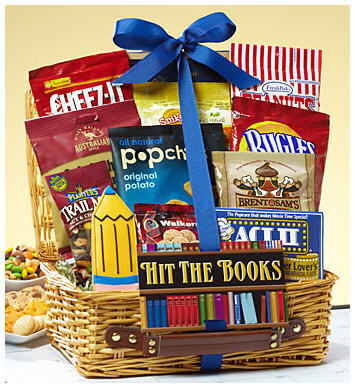 Although this gift is more of a box than a basket, they are sure to appreciate this extra burst of fuel for their mind! Cookies, and brownies, and cakes, oh my! Make them the most popular kid in the class or dorm room with a generous Dessert Gift Basket, sized for sharing with your scholar’s new friends and classmates. Hooray for National Eat Outside Day! Congratulations to Jen (posted at August 11, 2011 at 11:47 am), Amanda (posted at August 4, 2011 at 7:52 pm), & Esther P. (posted at August 8, 2011 at 1:43 pm)! Please send your full names and address to me at amariscal@1800flowers.com and I can send over your Colossal Fortune Cookies! As always, thank you to everyone for participating and don’t forget to tell your friends to join us on Facebook. Back to School! This is actually really strange for me since this is the first fall since I can remember that I haven’t gone back to school (graduation is weird). Maybe I am just one of the odd ones, but I was always extremely excited to go back to school no matter how great of a summer I had been having. I could barely sleep the night before my first day or my first class (you would think it was Christmas or something). I love going to new classes and meeting new people, I love meeting new teachers or professors, I love picking my seat and getting to buy new notebooks, and binders, and picking out my favorite pens (0.5 mm fine point if you’re curious). And that first day of class where you write down everything perfectly because you imagine that this year you’ll be more organized and neat with your notes and you’ll be on top of your game every single week (first week dreams obviously). Everything is all fun and games, and then you get your first student loan bill. Have a kid who just left for freshman year at college? Please post about a paragraph telling us about it feels to have your kid/nephew/niece/cousin away at their freshman year of college and how you think they must be feeling. We really want to hear your thoughts on this because we as parents have this on our minds at this time of year. It’s a big time of year for both the parents and kids. Life for both is changing. We want to make sure we capture those emotions and sentiments as we begin to design all new concepts and designs. We’ll pick 3 random posters and send their kid/nephew/niece/cousin the Snack ‘N Study Gift Baskets along with a message of your choosing. 1) Winner #1 is “Jen“! 2) Winner #2 is “Charlotte”! 3) Winner #3 is “Kim Staton”! If anybody’s searching, here’s an active coupon code: BSKTS15FB (15% off your entire order).